A few years ago I went through a micro fiction phase. I was inspired by a “postcard story” contest. Submissions had to be stories told in 250 words or less. I thought if I cranked out a 250 word story a day for 10 days, chances are I’d like at least one of them. I didn’t win the contest, but I did end up with the first five chapters of a flash fiction series I intend to finish one of these days. I discovered how much fun flash fiction can be, especially if you don’t attach any expectations around the work and just keep cranking them out. The first thing I did when I sat down to write them is I just started thinking about random start lines. Each day I would pick and expand on one of them. I can’t think of the author who has the “50 first lines” exercise… if you know who it is, let me know. I just remember that you’re supposed to start the exercise by writing 50 first lines. So, there you go. Excellent weekend workout. Write 50 start lines! Who knows… the lines could turn in to poems, vignettes, short stories, or even a novel. Don’t spend too much time on them. Less than an hour. Just write them as fast as they come. Don’t judge them, with 50 first lines you can throw out 90% of them and still have lines to work with. 1) Picking up the chipped coffee cup he wondered what Thelma would have to say about him being fired. 2) From the surface of the moonblue water, a tail emerged like a telescope. 3) Her credit card was maxed and her bank account was dry, but by God she was going to have a good time at the space station. 4) Mumphy paced back and forth in front of the delivery room and wondered if it were too late to tell Chelle he no longer wanted to be a part of the experiment. 5) “I wouldn’t get on her bad side if I were you,” Kris said as I studied the woman who he claimed had some kind of holy control over his life. A few years ago I got uber-inspired when I read about a contest sponsored by the Writers’ Union of Canada (not to be confused with the Writers Guild of Canada). The contest is called the Postcard Story Contest and it’s open to all Canadian citizens and landed immigrants (sorry, you non Canucks and non Canuck-landed peeps). The challenge is “to create a dramatic, short, snappy piece in only 250 words. You can use humour, poetry, dialogue…anything goes.” Of course I love a good challenge, so I decided to write a postcard poem every day for 10 days. I figured if I wrote 10 I was bound to like at least one of them. 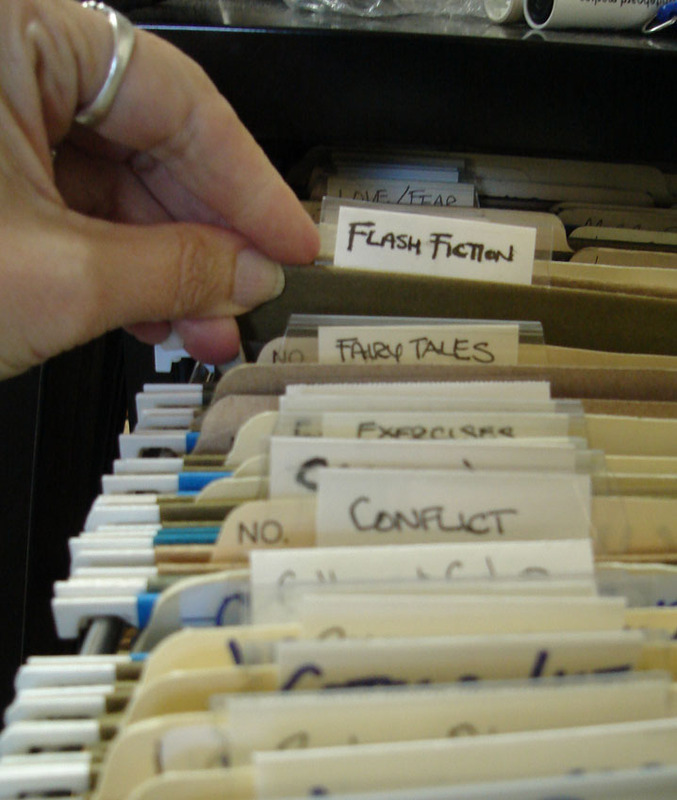 This type of fiction is often called Flash Fiction or Micro Fiction. Keeping it simple, because it’s the end of the summer, your workout this weekend is to write 3 flash fiction stories (250 words or less). If you have no idea how to begin the story, I’ve supplied you with several start lines below. You can also just randomly pick a line from a book you’re reading. When I want to write a flash fiction story, I usually just crank out a bunch of first lines over and over until one inspires me and I jump into that story. That’s why I have all these leftover first lines which I’m giving to YOU absolutely FREE. She packed everything except the salt and pepper shakers. He was the biggest kid in the class at 310 lbs. As soon as he had mailed the letter, he regretted having done so. When he awoke from his dream, he had the answer. If she was going to leave him, it was now or never. There was only one person left on her Christmas list. I buried the dog on Monday. The zoo was completely empty. He trembled as he walked up to the blackboard. When he awoke from his dream, he had the answer. The final chapter for his book. A way to end it that was not contrived, not maudlin… a way to imply “happily ever after,” but not in fairy-tale manner, in a way anyone could believe might happen. He stumbled out of bed. It was 3:15 am. Where was his laptop… no, forget the laptop, this had to be written in ink, writer’s blood, it had to flow like his dream… his dream… He had been dreaming of Samantha. Of how she had looked at 17 and he was fresh from the Navy. He had met her at a café. She was a waitress studying art history. He was a writer disguised as a servant of the government. She saw right through him. He’d left poems on napkins for her. He’d asked her to marry him by writing the words on her bathroom mirror. She’d said yes in red lipstick. He stumbled through the hallway, bathed in strangely green light. Without his glasses on, it looked as if he were underwater. The walls breathed like gills. He didn’t remember the house having so many pictures. Ghostly figures in large frames followed him until he reached his office. The door was closed. The doorknob so cold it caught him off guard. Then the smell, subtle, yet unmistakable, the perfume Samantha had worn every day for 50 years. He opened the door and was enveloped in the light. If you want, please share your postcard stories in the comment section or with a link to your blog.